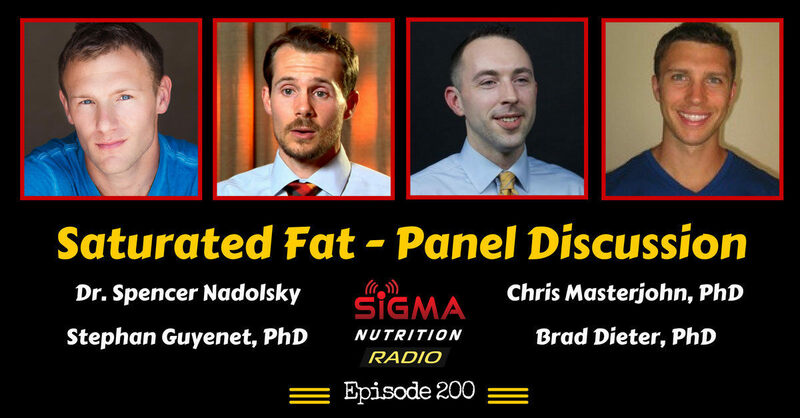 Episode 200: Our 200th episode is a special and unique one with an in-depth panel discussion on the topic of saturated fat. On the panel are Dr. Spencer Nadolsky, Stephen Guyenet PhD, Chris Masterjohn PhD and Brad Dieter PhD. Dr. Nadolsky is a a board certified family and obesity medicine physician. He is known for being extremely passionate about using exercise and lifestyle interventions as medicine, where possible. Dr. Nadolsky runs an online clinic, SteadyMD.com, where he can help patients all over America. He is also the author of The Fat Loss Prescription. Chris has a PhD in Nutritional Sciences from the University of Connecticut. He was formerly an Assistant Professor of Health and Nutrition Sciences at Brooklyn College. Chris currently writes detailed nutritional science articles on his blog chrismasterjohnphd.com and hosts a podcast, Mastering Nutrition. Brad holds a PhD. in exercise physiology from the University of Idaho. Brad has also done research training as a fellow in biomedical research, examining how nutrition and metabolism influence disease. Brad also runs Science Driven Nutrition, an online platform that aims to spread evidence-based nutrition information. Benefits of consumption of SFA-containing foods? Effect of SFA (and/or total dietary fat) on food intake: effect on satiety? palatability? Practical Implications: Is there a best target intake range of SFA for health? Is there an “optimal” ratio of SFA:MUFA:PUFA?